A Haploidentical Stem Cell Transplant was successfully performed on a 4-year-old male child suffering from a rare blood disorder called Fanconi’s Anemia. The incidence of this disease is such that only one case is reported per four lakh people. 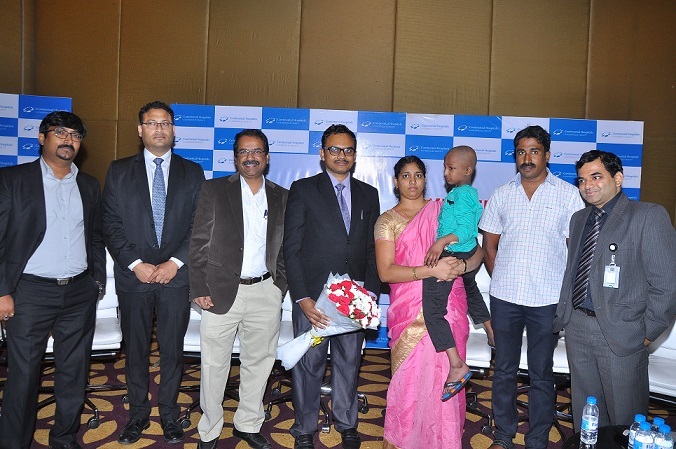 Parents of Haneesh Verma, a 4-year-old child from Hyderabad consulted Continental Hospitals on the 31st of October, complaining about multiple ailments since birth, of which the most recent and troublesome was drop in the levels of blood cells (Aplastic Anemia). After detailed investigations, Haneesh was diagnosed with Fanconi’s Anemia- which is an autosomal recessive condition with affected children landing into severe bone marrow failure by the age of 8 or 9 years. According to the Fanconi’s Anemia Research Foundation, more than 60 percent of patients born with FA have at least one physical anomaly with median lifespan of less than 2 decades. In 38 years of European History, only 729 cases of Stem Cell Transplant in Adults have been treated. Continental Hospitals- a Gleneagles facility is a 750 bed state-of-the-art, JCI and NABH accredited multi-specialty hospital in Hyderabad. It has award winning Level 1 Emergency and Trauma Centers with 21 modern, specialty-specific modular Operation Theatres. Driven by a strong interdisciplinary collaboration, the teams of accomplished medical experts deliver personalized and exemplary patient care across more than 30 specialties leveraging the most advanced evidence-based medicine and cutting edge technology. Continental Hospitals is a part of Parkway Pantai Limited which is a fully owned subsidiary of IHH Healthcare Berhad- one of the world’s largest healthcare group by market capitalization operating in 10 countries, 50 hospitals with close to 10,000 licensed beds. LOCATION: Natives of Amalapuram, East Godavari, settled in Hyderabad.